2017 has already poised to be an incredible and successful year for Secure Sense. Our team has been working endlessly towards our ultimate goal of becoming Canada’s most trusted cyber security firm. That being said, we’d like to take the time to share some exciting updates and give you a snapshot of what has been going on at Secure Sense. Grab a coffee, because we are ready to go! We started off 2017 with a bang when our corporate sign got put up. (Literally, it was very loud for a few days). Success is truly a team effort, we wouldn’t be here if it weren’t for the dedication of our employees, support of our partners and belief from our customers. Here are a few words from our CEO, “…when I started, one of my big goals was to grow this firm to a point where we can get our name on a building. Today I achieved that personal milestone. Thank you to all the employees, customers, and partners that helped us achieve this milestone…”. Cheers to a great 2017. Growth is the most accurate word to define what Secure Sense as a company has experienced over the past year. We have grown in size, including the number of employees, customers, and vendors; these are statistics that are visible to individuals looking in. What is not as evident is how as an organization we have grown internally to meet the needs of our customers and how our collective drive to grow is truly what separates us from other companies. Our employee growth has forced us to accelerate the plans to move to a larger office space. Luckily the move to a new place will not remove us too far from our headquarters, as we are taking over an additional floor in our building and revamping the facilities entirely. The new office design is innovative, collaborative, and the open concept features help reflect Secure Sense’s unique vision and office culture. The renovation will include crafting a state of the art SOC environment, built in a fashion that coincides with the fast growth that we have experienced in our MSSP practice. Our sales and professional services teams are the brute force behind the growth in customer base at Secure Sense. To help support these departments we will be designing a space with features that will help facilitate customer development by including internal meeting rooms, individual workspaces, and an overall office that promotes teamwork and collaborative thinking – foundation features of Secure Sense. Stay tuned for images of our new space! Look out San Fran, Secure Sense is headed to RSA and we are ready and eager to learn all about the up and coming technologies in the industry. We’ll be walking around the expo hall, say hi if you see us! While we can’t give you chocolate and flowers this Valentines Day, we can offer the city’s best seafood, finest wine, and engaging security discussion. If you’re a customer at RSA, join us Feb.14 for seafood and security at Sotto Mare. We have a lot of exciting updates to share, and we’d love to host you. RSVP here! Saying that cyber security had a major presence in 2016 would be an understatement. Cyber security and information technology was at the forefront of organizations minds in 2016 and will continue to travel to the top through 2017. (Mark our words!) We’ve compiled a security resource complete with the best-of-breed technologies to better help you navigate through the industry. Click the link to download your Orange Book! It may only be January, but we’re already in full throttle with Camp preparations. 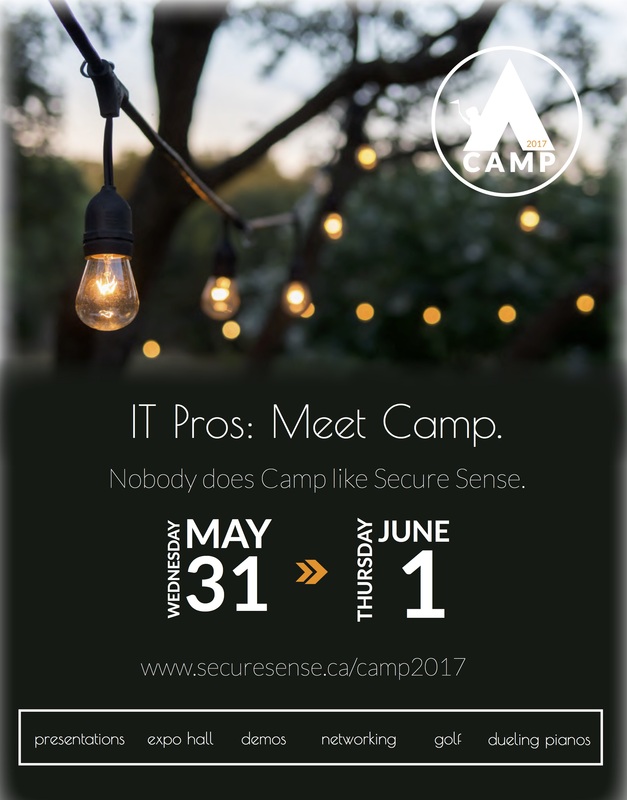 This year is a huge year for Secure Sense, and Camp specifically. That being said, we are making camp BIGGER AND BETTER. Seriously, we have a laundry list of new and exciting things coming to camp, but unfortunately, we’re not able to spill the beans quite yet! Follow us on social media to get all updates! If you’re new to camp, check out what happened last year here. And if we’ve already sold you, register here on our early bird site! You can find Secure Sense on Facebook, LinkedIn and Twitter. Follow us for current company updates and industry news.